George David Marks, Sr. died peacefully in Orangevale, CA on May 24 at age 94 years. He is survived by his loving wife of 66 years, Sharon Marks, and cherished children G. David Marks, Jr. and Roxana Rhodes. Beloved “Pappy” of grandchildren Sarika and Nandan, he is also survived by his younger sister Mildred Lombardo of North Carolina. George was born in New Castle, PA on August 22, 1921, the seventh of twelve children. Following Pearl Harbor, George was drafted by the Army. He had used his self-taught knowledge of Morse code to get accepted as a radio operator intercepting and interpreting German transmissions for G2 Intelligence in the 117th Signal Intelligence Company. He served in the Army for 32 months, in five campaigns, followed by 25 years in civil service at McLellan Air Force Base. He had taught himself French, Italian and German during the war, and following the war became fluent in Spanish and American Sign Language (ASL). After the war had ended, George rediscovered his love of folk dancing. It was during this activity that he met Sharon. He often joked that he moved to California so he “wouldn’t have to marry a cousin.” They started dating and married in March 1950. He later found work at McClellan Air Force Base, retiring in 1985. He also served 19 years as an ASL interpreter working with sheet metal workers at McLellan. George was a dedicated husband and father to his two children. Camping and swimming were popular family activities. A constant presence at antique car swap meets; he was also a charter member of the Root Cellar, Sacramento Genealogical Society. George’s “computer” memory allowed him to memorize thousands of names, dates, and relations, which consistently amazed those he met. He also loved getting to know people, their names, and guessing where their accent came from, and happily greeting them in over half a dozen languages. In recent years, he joined the American Legion Post #637 of Citrus Heights. 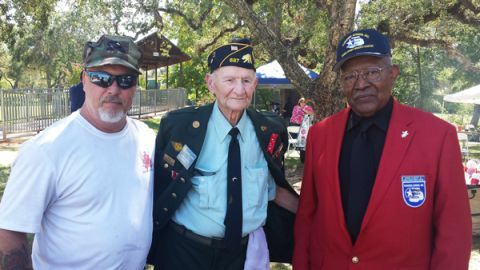 George and several of his fellow WWII veterans had also become regulars at the annual Citrus Heights Veterans Appreciation Picnic since 2012 where he would often sport his Army dress uniform, dance with the ladies and tell his much-loved stories. Donations made in memory of George Marks can be sent to the Citrus Heights American Legion Post 637, P. O. Box 1 Citrus Heights, CA 95611.
, Sr. died peacefully in Orangevale, CA on May 24 at age 94 years. He is survived by his loving wife of 66 years, Sharon Marks, and cherished children G. David Marks, Jr. and Roxana Rhodes. Beloved “Pappy” of grandchildren Sarika and Nandan, he is also survived by his younger sister Mildred Lombardo of North Carolina.